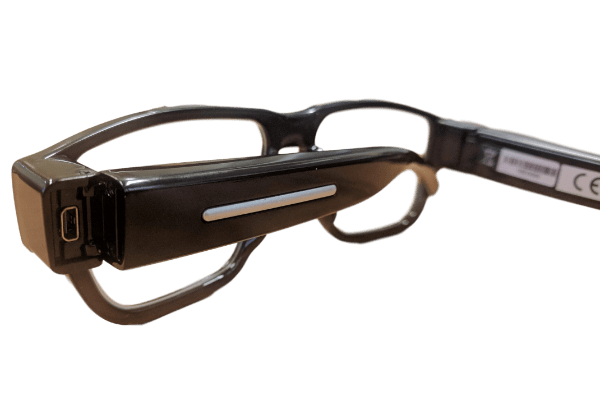 These Camera Glasses are our premium grade spectacles that have a spy camera and recording system built in. More expensive, but chosen by law enforcement professionals for their design, quality of video, crispness of audio and for their discreet mode of operation when being used on-the-go. The surveillance professional capturing video on-the-go requires a quality portable covert spy camera that’s easy to operate and gets results every time. These Camera Glasses certainly deserve serious consideration by law enforcement operatives or others looking for a high quality solution. The Camera Glasses are designed with the spy camera and recording system discreetly built in. The camera is located in the outer edge of the left lens frame incorporated into a geometric pattern that is also replicated on the right lens frame. The high quality video recording system captures in 720p high definition and the accompanying audio is extremely crisp, with the microphone able to pick up sounds several metres away. The camera deals with changes in light effectively and the resulting video is certainly very smooth. The design of this camera solution is very well thought out. 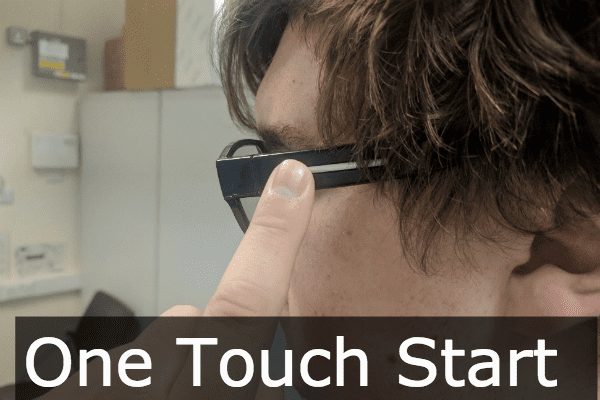 There are no exposed switches or charging ports on view when the glasses arms are open which is really important so as not to arouse any suspicion. The video recording operation can be set in motion without removing the spectacles, by pressing the silver detail strip on the left arm. To confirm start up the glasses discreetly vibrate, so there are no flashing LED’s or anything else that would alert attention. Once recording the glasses wearer can then conduct video surveillance ‘hands free’. Recorded video has time and date stamp on the video footage which is ideal for evidential purposes. Folding the left glasses arm exposes a USB port that is where the supplied charge lead can be connected to charge up the inbuilt lithium battery. After a full charge the glasses can record video footage for up to 70 minutes. Also exposed inside the end of the folded left arms is the microSD card slot. A 16GB card is supplied, but the device will accept up to a 32GB card, a cost option shown in the dropdown menu. Playback of recorded files is simply a matter of removing the microSD and plugging it into a computer card reader for playback of files through the computer media player. Generally files will play simply by using the standard installed media player, but if not then we recommend a free downloadable player called VLC, that plays almost any media files. 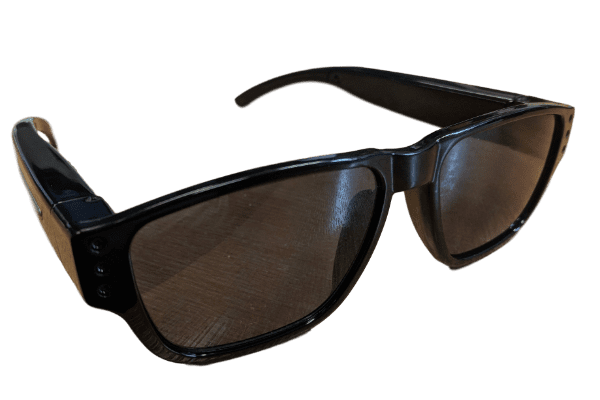 Although the glasses cannot record video in total darkness, dusky low light recording is achievable and with a 67º angled lens the camera is able to achieve a reasonably wide view. 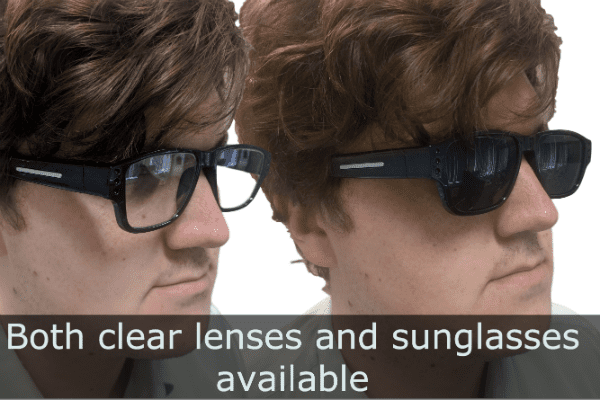 The glass lenses are clear with no magnification, however it should be possible to change these to prescription lenses by taking the camera glasses to an independent opticians. The operating system is compatible with both Windows and Mac. 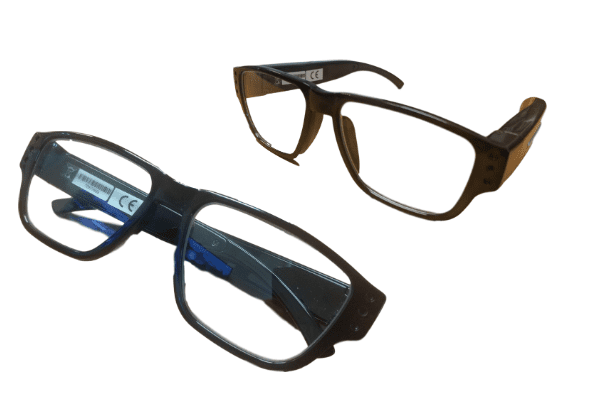 Can the Camera Glasses be fitted with prescription lenses instead of the standard clear lenses? 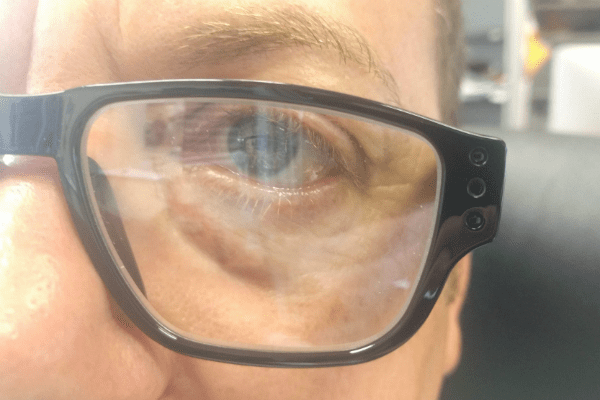 Yes, in many cases it should possible to fit prescription lenses, although it may be best to get this professionally done by an independent optician as opposed to one of the big brand high street outfits. Has the operating system got the option of a motion detection facility? No, this unit can only be activated manually for both taking video and imagery. For the type of use, it is not really an advantage to have motion detection anyway. 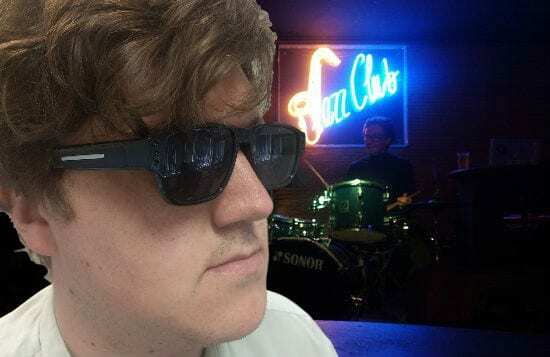 Can the Camera Glasses just record audio with NO video? No, these are specifically designed for video (with audio) only. If you want a pure audio recording device then please see our Recording Devices section. How do I know if the subject that I am recording is in view? Although the camera lens used is only a pinhole, it has a 67 degree wide angle lens which means that simply facing the subject will enable you to capture within the frame area. Is the footage taken by the camera good enough to identify somebody? Absolutely, the imagery is smooth and clear, easily good enough to identify somebody when they are reasonable near to the camera at the time the footage is obtained. I have seen cameras before claiming to be HD. Is this for real or just upscaled lower quality imagery? The video footage is not upscaled on this device and is full 720p, High Definition. The way the system handles the light and movement means high quality output. Dependant on how much you intend to use the Camera Glasses during a period of surveillance, it may be best to have a USB battery charge pack available. 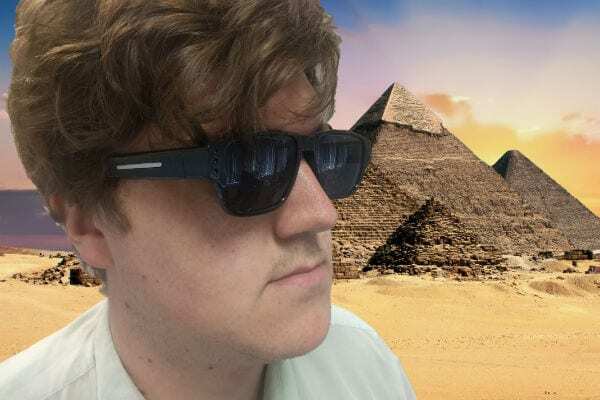 You will need access to a computer with a USB port and speakers in order to connect the Spy Glasses to offload and playback recordings from the microSD card used. It maybe advisable to have more than one microSD card for versatility..
You will need a media player on the computer for playback of video / audio files. It maybe worthwhile downloading a free media player. We use VLC Media Player at Spy Equipment UK.